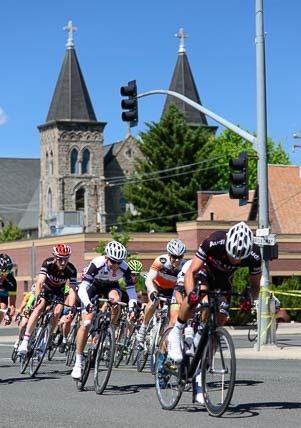 June 2014 – Baker City Oregon is in the heart of some of the best road cycling in America. This is rolling farm country where ranchers own land by the section (that is, by the square mile!). 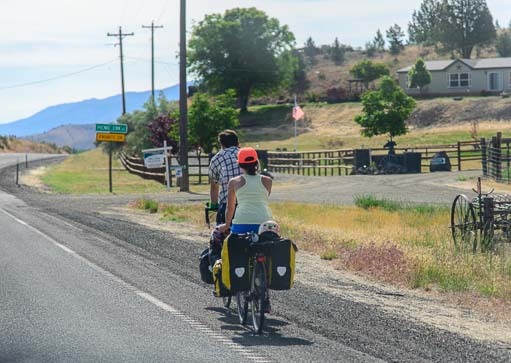 Cyclists roll by all the time in eastern Oregon. 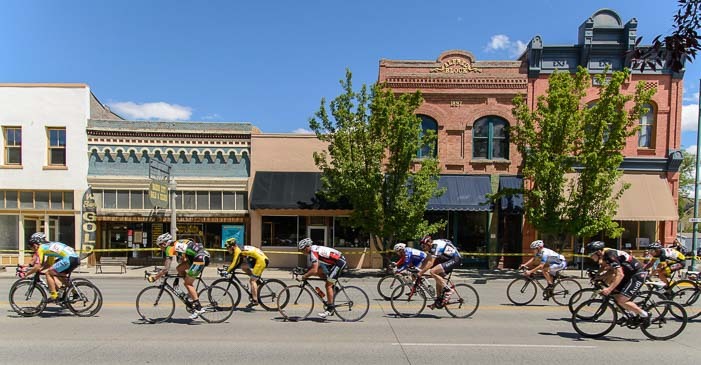 Baker City is in the heart of cycling country. The roads are well maintained, with generous shoulders, and there is nary a car to be seen once you get a few miles from town. On our way from Bend to Baker City, we played hopscotch with long-distance touring cyclists heading east with us (the prevailing winds are out of the west). Eastern Oregon is a great place to develop legs like these! Some were on shorter tours with local clubs while others were individuals traveling cross-country on their own with panniers on their bikes. For a few days on these scenic roads we kept passing, and being passed by, the annual trans-America organized ride put on by America By Bike. 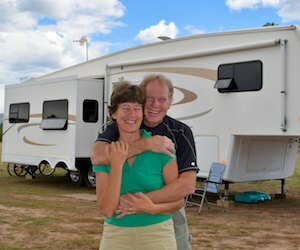 They were en route between Astoria, Oregon, and Portsmouth, New Hampshire, a 51 day trip. Hammering it out in the final sprint to the finish line. 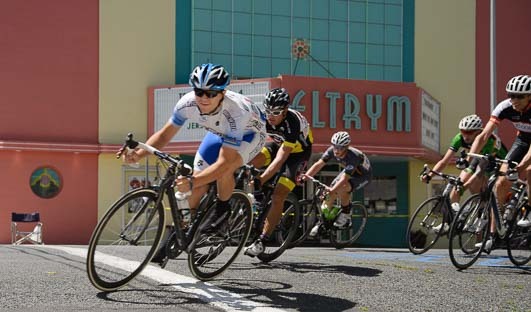 When we got to Baker City, we saw posters for the Baker City Cycling Classic, a three day bike race with four race stages that attracts over 150 racers from Oregon and nearby states. By some wonderful, sweet, unplanned, good fortune, we just happened to be in town on the weekend of the race! 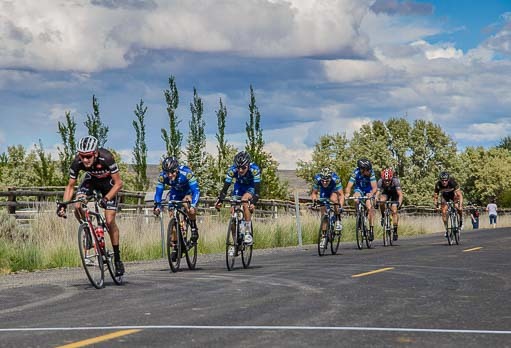 With two road race stages out in the countryside that are 72 and 84 miles each, and an 11 mile downhill time trial, there was a lot of racing to see. We went out to the finish line of the first road race and watched the cyclists descend the last mountain of the day and sprint to the finish line. What a rush! 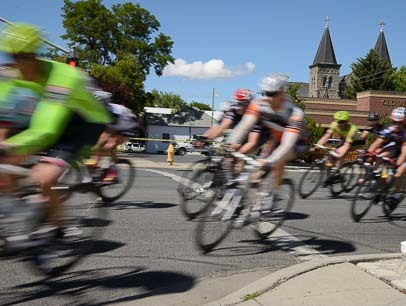 The third stage of the race is a wild Saturday afternoon criterium circuit race around the streets of Baker City, and it brings out the crowds. As we waited for the race to begin, we noticed two little boys and a girl starting a race of their own on the sidewalk! After they got to their turnaround point at the end of the block and headed back, the little girl roared by us, hell bent for the win! Meanwhile, the streets had been blocked off and all the restaurants set up chairs outside for the fans to eat lunch and sip microbrews while watching the action. Wandering around the empty streets, we saw cyclists warming up on trainers with their teams. A few rode a lap or two around the 1.1 kilometer course to check it out. Bikes blur past the Geiser Grand Hotel downtown. 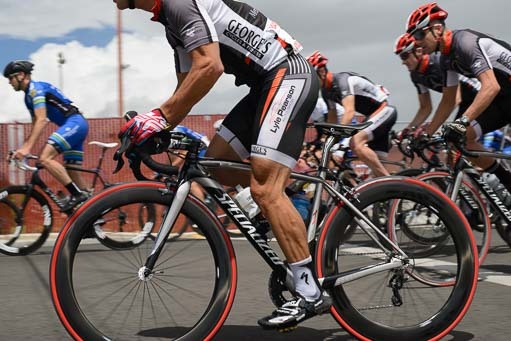 The racers were divided by the USA Cycling category divisions, and they were unleashed on the course one group at a time. Each race lasted from 40 minutes to an hour, depending on the caliber of the racers. The bikes just kept coming and coming, round and round. 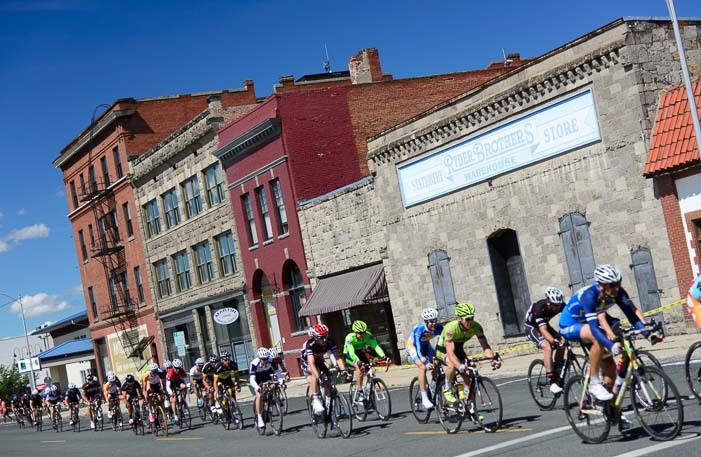 The historic streets make a perfect backdrop for a bike race. 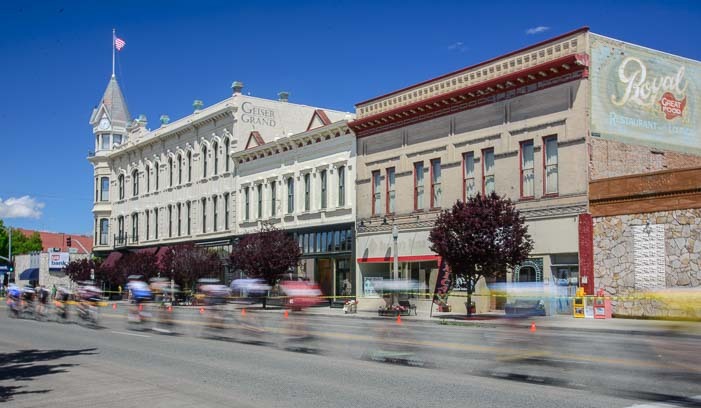 As I mentioned in my last post about Baker City, Oregon, this is a really pretty town full of historic Victorian buildings. 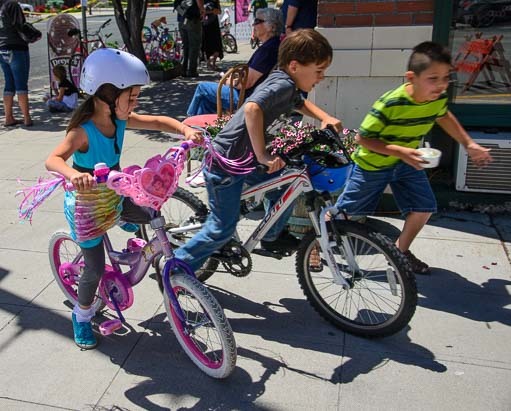 What a great way to show off the city — with colorful cyclists filling the streets! The race went on all afternoon, so we could walk around to different parts of the course. Baker City’s historic Eltrym movie theater. 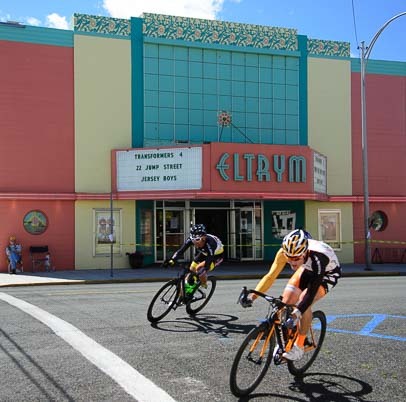 The night before the first road race, racers and fans gathered in the historic Eltrym movie theater to watch Half the Road a movie about professional women’s cycling. This thought-provoking film is a must-see for anyone interested in professional sports, the lives of elite athletes and/or the empowerment of women. I still find it incredible that in my own lifetime we have gone from Women’s Lib bra burning to being defended by female fighter pilots. And in recent years, a woman has nearly made the men’s podium in long distance triathlons! So what a surprise it is to learn from this film that the Union Cycliste Internationale, the governing body of the sport, is deliberately inhibiting the growth of women’s professional cycling because they believe women aren’t physically up to the demands of the sport! 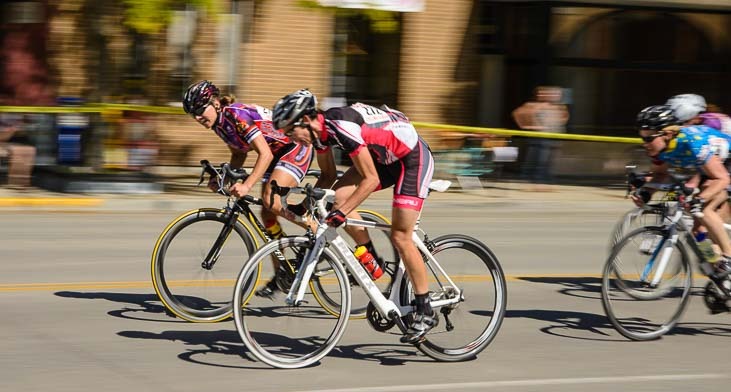 Do women have what it takes physically to race bikes? St. Francis Cathedral peaks out behind the charging pack. 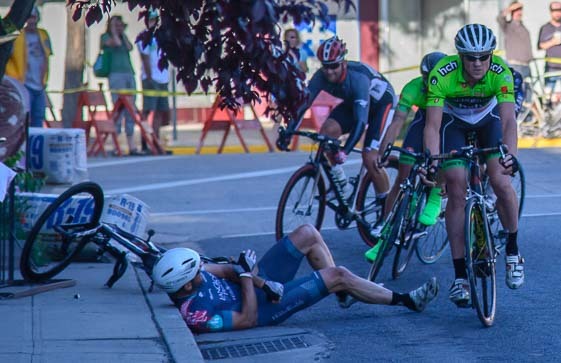 What would they say if they saw the determined women cyclists here in Baker City racing through driving rain and pelted by marble sized hail as they negotiated the steep climbs and descents on the first day of this race weekend? Popular and funny cycling commentator Bob Roll presents the infuriating facts (including startling interviews with UCI’s top brass) with good humor, making me want to laugh and cry at the same time. With the current demand for a higher minimum wage, how shocking that professional women cyclists worldwide would be happy just to have a wage! Out on the downtown race course, the fabulous Oregon microbrews kept coming while the cyclists kept rolling, and fans were all on the edges of our seats. What a thrill to watch! Fans clocked the earlier and slower groups of riders at about one minute twenty-five seconds for each lap (about 29 mph). When the fastest racers, the Pro / Category 1 men, took the course near the end of the day, we clocked them ticking off laps at one minute fifteen second intervals (about 33 mph). On the sidelines the crowd became more and more animated each time the racers zoomed by. The racing had definitely reached that level of intensity. You couldn’t win this thing without taking risks, and the racers collectively threw all caution to the wind. We fans were out of our seats! Within seconds the pack came by and, sure enough, someone went down. Racers fish-tailed around each other. One guy did a cartwheel over another. Soon more bikes went down. Oh my, when bikes pile up in a corner, they really pile up. Miraculously, once the pack had scrambled through the mess, the fallen racers bounced back up and brushed themselves off! A few rejoined the race. 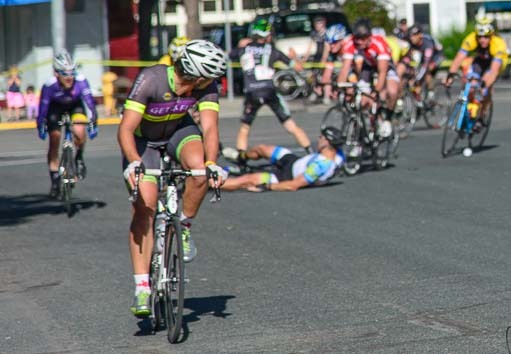 But in the final laps it happened again, and one unfortunate fellow stayed on the ground after the race ended while the EMT’s patched him back together again. They got him all bandaged up on one arm and both legs within minutes, and he was back on his feet and moving once again, although not with quite the same zip! In all that excitement we lost track of who had won. But it didn’t matter to us fans. 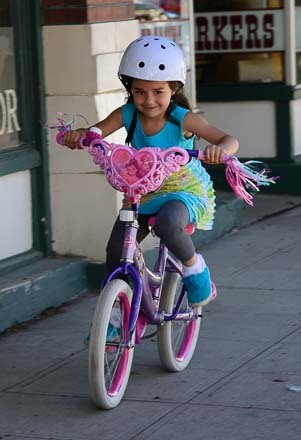 It was the color and the speed and the whir of spinning wheels that had made the afternoon so exciting. 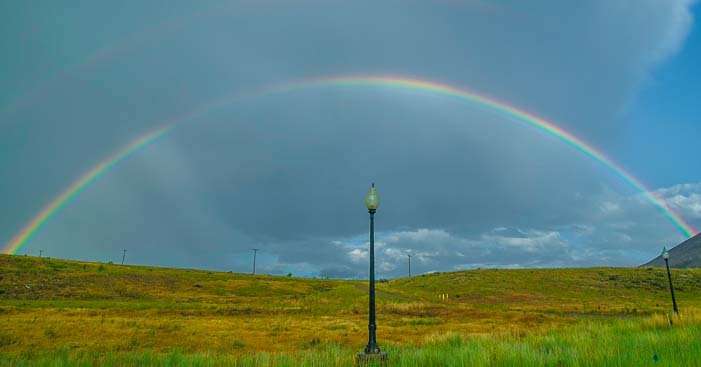 Rainbow after the hail storm that pelted the first road race. 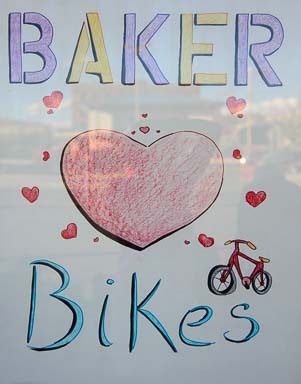 We sure are glad that Baker City loves bikes! 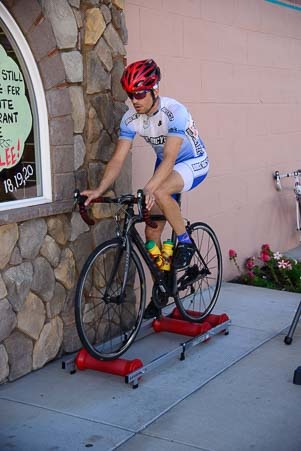 If you are here next June, grab a chair at a little bistro and kick back with a microbrew to watch this mini Tour de France from the front row!